This page contains a list of all obtainable weapons in the game, including their attack power, special properties and how to obtain them. 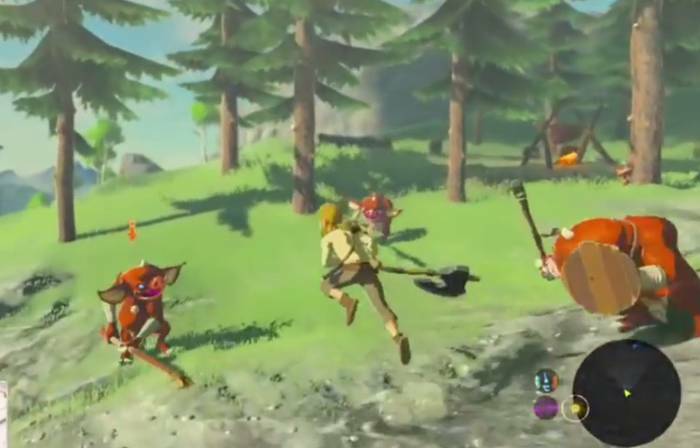 The Legend of Zelda: Breath of the Wild features an even more massive array of weapons that Link can use to defeat enemies, as well as get through various puzzles in the game. Please note that we will be updating this list once the game comes out on March 3, 2017. Below is a list of all obtainable weapons in the game, including their attack power, special effects and how to obtain them. The swords have always been the typical weapon of the hero. Link is no different. As the hero of Legend of Zelda: Breath of the Wild, Link journeys to all sorts of places. He carries all sorts of swords that allow him to fight in combat, depending what kind of enemy he fights. Certain swords have their own elemental properties. This gives Link the advantage on how to fight down enemies and have an easier time. Soldier’s Claymore 20 Heavy and slow to use. But it has good durability. Treasure chest at Bosh Kala Shrine. Traveler’s Claymore 10 Knocks away shields. A basic two-handed sword often wielded by aspiring adventurers. Its immense weight can knock enemies shields right out of their hands. Wild Drop. Knight’s Claymore 38 Only the most confident of Hyrule Castle’s knights carried this two-handed sword. Its cutting edge is finely honed. Treasure chest at the Keo Ruug Shrine. Knight’s Broadsword 26 Knights of Hyrule once carried this sword. These days it’s the weapon of choice for seasoned adventurers thanks to its ease of use and high attack power. Treasure at Shee Vaneer Shrine. Lanayru Great Spring; Hidden chest in Shee Vaneer Shrine. Great Frostblade 30 This magic-infused greatsword was forged by smelting ore found in the Hebra Mountains’ permafrost. Attack when the blade glows blue to expel freezing air. Shrine next to East Akkala Stable, far to the North East corner of the map. Great Thunderblade 32 This magic-infused greatsword was forged by the Hyrulean royal family using lightning from the Hyrule Hills. Attack when the blade glows golden to expel lightning. Great Flameblade 34 This magic-infused greatsword was forged in the fires of Death Mountain by Goron smiths in an ancient age. Attack when the blade glows red to expel flames. Iron Sledgehammer 12 Used to farm Geodes and Minerals. This large iron sledgehammer was originally used for mining, but it works reasonably well as a weapon too. Torch 2 Flame stays lit until it’s put away. You can make this out of a Tree Branch. Tree Branch 2 Basic toss-away weapon; can transform into a Torch if lit. Quartz Spiked Moblin Club ? Created from the Spiked Moblin Club.Use Geodes to upgrade the Spiked Moblin Club. Korok Leaf 1 Summons gusts to move around objects. Farmer’s Pitchfork 2 Used to easily gather hay. Lizal Spear ? Use this to grab fish. Wooden Mop 5 Just a mop to the untrained eye, it excels at tidying up the place. But it owes its sturdy construction to a true craftsman, so it actually has some combat merit. Boko Spear 2 Good for skewering fish and meat. Can be thrown when near breaking. Throwing Spear 6 Flies farther than average weapons. Flame Spear Inflicts fire damage on enemies. Moblin Spear 4 This wooden spear is most often used by Moblins. It’s made from a hastily whittled tree, so its stabbing power and durability are both pretty low. Spiked Boko Bow 12 Dropped from Bokoblins. Woodcutter’s Axe A tool for cutting down trees. Farming Hoe 16 Used to till fields. Soup Ladel 4 A kitchen implement often used for serving delicious soups. It was carved from the wood of a sturdy tree, so it actually packs quite the wallop. Vicious Sickle 16 A grim weapon favored by the Yiga. The half-moon shape of the blade allows for the rapid delivery of fatal wounds and serves as a symbol of their terror. Its durability is low. So, I’ve been wondering: Where do the super rare weapons and shields end up after they break? i.e Royal guards claymore, hammer, spear and the sheild?…these super strong weapons, do they just….break…forever? Hi Wesley, have you checked out Grante’s Shop for the lost items? For the spring loaded hammer, he called the shop “Kiltonis Shop”, not “Kilton’s Shop”. Question. Can the Ancient Bow be healed? I noticed that the Frostspear is missing, but the Flamespear was written twice. You can’t upgrade weapons. The Soldiers Bow has no upgrade and the Quartz-spiked Moblin club doesn’t even exist.